This is a trading software that will be very helpful for a trader. It can manage orders/pending orders,money management, martingale/averaging and trading time.Trader only need to make order manually and EA will manage all the rests. You do not have to spend hours sitting at your computer. As long as the EA run on the MT4 ,it will manage orders that made by a trader. The different than other is that it can also manage orders come from another EA.Make a magic number same between ' Order Management EA' and your another EA.Default magic number 0 is for orders that made manually (Manual Orders). 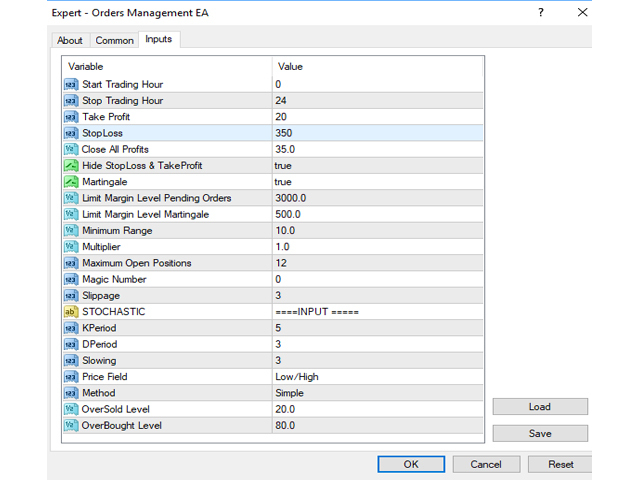 Start Trading Hour – Stop Trading Hour : the parameter to limit the EA work on the certain time range. Take Profit – Stop Loss : The value in Pips where the EA will close an Order. Close All Profits : The value of total in Pips where the EA will close all the same direction orders and same currency pair at the same time. Hide Stop Loss and Take Profit (True/False ) : If true,EA will hide stop loss and take profit.If false,EA will create stop loss and take profit automatically once trader opens order. Martingale (True/False ) : If true,EA will open new order with the same direction when existing order is floating loss in certain pips. 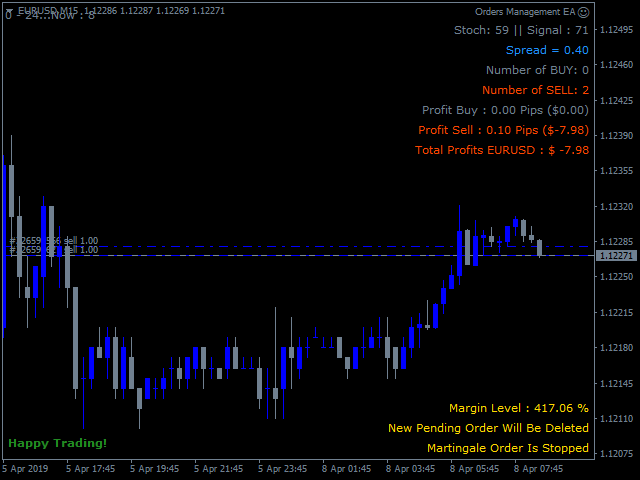 Limit Margin Level Pending Orders : If value is reached,EA will close all existing pending orders. 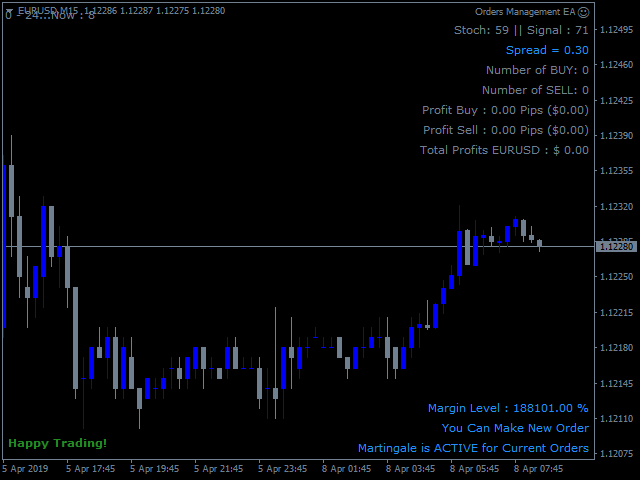 Limit Margin Level Martingale : If value is reached,EA will stop to make new martingale order. 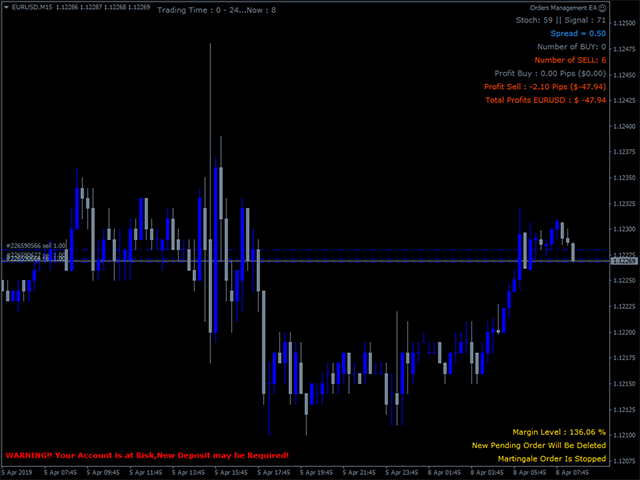 Minimum Range : The minimum distance between each martingale orders,the value in pips. Multiplier : The other word is Lot Factor.This is the multiply of Lot Size of Martingale order. Maximum Open Positions : The Maximum number of open positions in the current symbol/currency pair. Magic Number : unique value of number. It can be any numbers. IMPORTANT : Default value 0 is to manage manual orders. It won’t manage manual orders if the value ≠ 0. The EA can also manage orders from another EA as long as the Magic numbers both of them are same and the value ≠ 0. Slippage : The difference between the expected price of a trade and the price at which the trade is executed.This only apply on martingale orders. Stochastic parameter is to provide martingale order signals.This is same with regular stochastic. Recommended to install the EA on the VPS. It can maximize the work of the EA because it can be online real time. If you need more details related with the use of this EA,please don't hesitate to contact me.